and finally these, which I had never seen before, from the Press Interviews for the BBM opening in Melbourne. 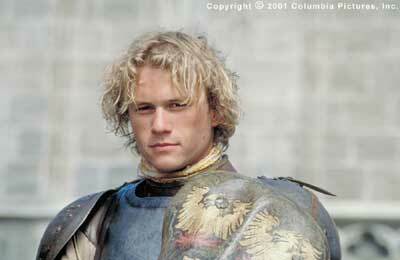 A Knight's Tale should be required viewing for every Heathen. He's so darn cute! You guys have probably seen this, but it's worth repeating. From the premiere of "Say It Isn't So" ? Those are all marvelous! Especially the one with the poster behind him. That baby is the most adorable little one I have seen in ages! And dad...got some swooning going on here, I think!! To quote my late grandma, "That baby is the spittin image of her Daddy!" Lucky little gal. Gorgeous Heath Ledger for her Daddy and the breathtaking Mr Gyllenhaal for her Godfather!